Welcome to Fred Astaire Dance Studios in Bloomfield Hills, Michigan – whether you want to learn Ballroom Dance or you’re interested in Latin, Swing, Country, Salsa, Tango or a any other popular dances, we make it fun & easy for men and women of all ages to learn to dance! You will feel right at home in our friendly & relaxed atmosphere. We love to introduce beginners to the joys of dance or explore the subtleties of technique with the advanced dancers. We offer private lessons, group classes, private group classes, wedding preparation, practice parties and more. Whether you’re interested in social dancing, competitive dancing, performing or having a special dance choreographed for your wedding, or just want to dance for sport, as exercise or just recreation, our qualified, nationally certified instructors will help you reach your goals while ensuring that you have plenty of fun along the way! We live each day by our mission statement: To enrich the lives of anyone and everyone who is associated with us. Dance is in the mainstream and you don’t want to miss out on all the fun, good exercise and excitement dance can bring! At Fred Astaire Bloomfield Hills, we believe everyone has the ability to experience the joy of dancing. This philosophy led to the establishment of Dance Mobility; Michigan’s only wheelchair and amputee ballroom dancing program for adults and children with physical disabilities. Our Dance Mobility program provides free monthly wheelchair and amputee ballroom group lessons, led by Fred Astaire’s professional, certified dance instructors with experience in teaching wheelchair and amputee ballroom dancing. Participants are welcome to bring their own dance partner or they will be paired with a partner. From Waltz to Tango to Salsa, we offer all styles of dance lessons in a fun, friendly, supportive environment, while promoting physical, social, and emotional well-being. Private lessons are also available for a fee. Dance Mobility’s free group lessons are supported by a grant from the Rehabilitation Institute of Michigan Foundation. For more information, call 248-454-1715. 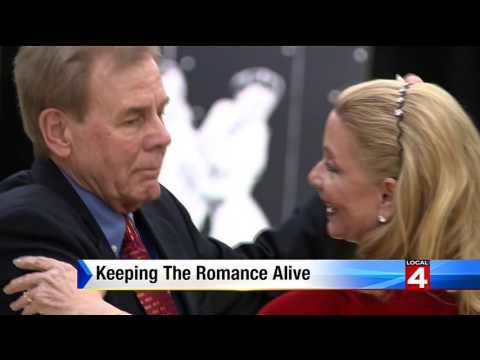 Fred Astaire Dance Studio of Bloomfield Hill’s very own Tom and Michaela Hector show the power of ballroom dancing when it comes to keeping the romance alive in any marriage!